One would think that, after being in power for three decades, Cambodian Prime Minister Hun Sen would feel more secure about his position. Sadly, this is not the case. The strongman has a weak temperament, and no mandate from the people is enough to put him at ease. As he prepares for a general election next year, he has decided to go after his political challengers and critics. Dr So Naro Part 167 តើទំនាក់ទំនងជាមួយអាមេរិកគឺជាអំពើក្បត់ជាតិ ? Many youth have written to me: "Even though they are removing your photo from public places, I have already carved it in my heart and mind." (Interview with Voice of America, August 1, 2017). The most intense local election competition has done with a result of unfavorable for both leading parties-- CNRP and CPP-- though CPP can manage to maintain about 70 per cent of their commune chiefs or 1,165 communes and sangkats, CNRP has wrestled to regain more than 400 commune chiefs from the CPP. And the popular votes CNRP got 45 per cent while CPP received 48 per cent and the other 10 small parties received the combined popular votes 7 per cent according to unofficial data from NGO. However, the NEC did not reveal the number of seats each party received yet. But they expect The CPP will receive at least 6,000 seats and CNRP will receive over 5,000. At the same time both parties have claimed their popular votes have increased from previous election in 2013. nonetheless according to NGO, CPP still maintain their votes from 2013: about 3.3 million votes while CNRP have increased their vote to 3.15 million votes, closer to CPP. Now we have seen that the gap of popular votes between the two major parties get closer from term to term even if CPP still hold power firmly in both local and national levels. How can CNRP try to break this iceberg, meaning to close the gap of popular votes and win over the CPP which has ruled the country nearly 40 years. 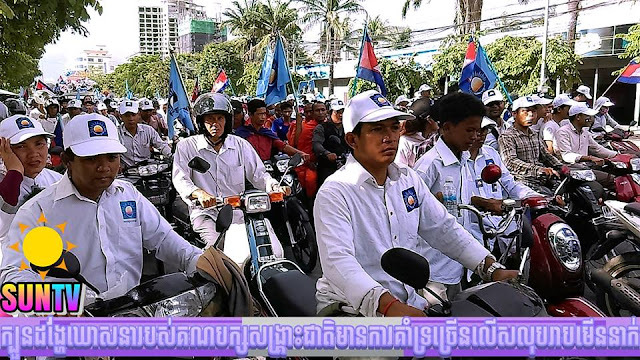 If election is hold freely and fairly as if in the Western democracies, CNRP would win landslide since 2013, but the political environment in Cambodia is very tight and dangerous. CNRP, the largest opposition in the country has been persecuted severely from the ruling party, CPP: their leader Sam Rainsy was forced in exile in the third times and many CNRP's activists and human right defenders were jailed without reason. Thus, how can CNRP manage to win the national election in 2018 without a fair playing field? The CPP still has its ill will to destroy its rival, CNRP, at all cost. In the next couple months, there will be more campaigns to weaken and destroy CNRP plotted by the CPP. Especially, its president Kem Sokha who had numerous pending cases against him in Hun Sen's control court. And the new commune chiefs and council members from CNRP will face more obstacles to run their communes too. The CPP may not provide enough fund to develop any commune run by CNRP, and they face with unfair accusation of corruption, crime, and any activity that the CPP can manipulate. The following email was leaked to Khmerization from someone named Sokan Sok, which is the name of one of Deputy PM Sok An's sons, from exactly the same email address as Sokan Sok's Gmail email (sokan.sok@gmail.com) seen below. Hope this note of mine will see Excellency in good health and high spirits and would like to take this opportunity to send Seasons Greetings to you and your family! The President/.CEO of the business council shall be responsible for cementing the relationship of the business communities of Asia and Latin America by cooperating and collaborating with each other to create win-win smart partnership for the better economic benefits of the respective regions. The business council shall periodically and as often as practicable , promote initiatives ( like organizing seminars with Forbes Asia Conference, Channel News Asia Conferences and other regional conferences ) , dialogues and meetings to bring the relevant parties to work closer together with objectives to create awareness & opportunities, form joint ventures and partnerships . The candidate is expected to travel extensively and network with governmental , political & business leaders, and individual parties to further the Business Council's vision, mission and long term relationships that shall meet the Business Council's objectives. Instinctively , I remember that Excellency great dedication to the cause of ICAPP and proximity to Latin American countries shall be the ideal person of choice to fill in this position as President, ICBC Asia. I shall be most grateful if I can move this subject matter a little bit forwards if Excellency express an interest to serve this very noble cause of crating a regional powerhouse which can further perpetuate the legacy of ICAPP. I suggest that the cabinet/office of the Chairman of the Asian leg of ICBC shall be based in Phnom Penh , which shall work closely with office/cabinet of the Vice Chairman of ICAPP HE DPM Sok An here in Phnom Penh; proximity of Phnom Penh to East Asia and South East Asia is definitely an advantage. Please see attached final version of Memorandum for Chup (Cambodia) Co., Ltd. Please also note I have reviewed Cambodian law on commercial enterprise and made an informal consultation with the officer in charge of commercial registry of Ministry of Commerce to ensure that we can register this MOA without any further change. I found out that we need to change one provision regarding the appointment and removal of directors. (3) Angkor (Cambodia) International Co., Ltd, a private limited liability company duly incorporated and registered under the laws of the Kingdom of Cambodia with commercial registration no. Co. 8617/06P dated 07 April 2006, and having its registered principle address at No.2C, Street 120, Sangkat Phsar Thmey 2, Khan Daun Penh, Phnom Penh, the Kingdom of Cambodia, represented by Mrs. Cham Krasna (herein referred to as the “Company”). The Seller, the Purchaser and the Company are collectively referred to herein as the “Parties” and individually as a “Party”. 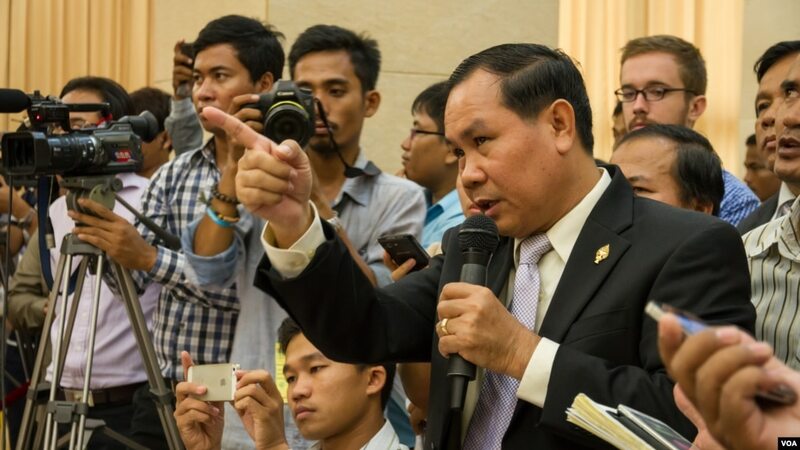 (D) WHEREAS, the Parties express their intention that, in giving effect to the Agreement, they will respect, and comply in full with, the provisions of applicable Cambodian law. I will forward your enquiry accordingly and i look forward to further communication with you soon. Thank you for your patience thus far and please allow us a few days to look into this matter. Good morning Sok An, I have been trying to get the attached email through to your father. Would you be so kind to draw it to his attention. and specifically disclaims liability to you and any other person for any loss or damage resulting (directly or indirectly) from the receipt or use of this communication (including any attachments). Good morning. Congratulations on your re-election. I look forward to working with you in the time ahead in ICAPP. I mention some time back that I was in the process of developing some interests in Cambodia. I seek your advice and counsel as to how best to progress matters. My association is through the Transcontinental Group (TRG). I have had a long association with the principals of this company. The Khmer Krom are ethnic Khmer who inhabit Kampuchea Krom, an area in southern Vietnam that was once part of the Khmer Empire. According to Vietnamese government figures (1999 census), there are 1,055,174 Khmer Krom in Vietnam. Other estimates vary considerably, with up to 7 million reported to Taylor (2014) in his The Khmer lands of Vietnam. In the late 1970s, the Khmer Rouge regime attacked Vietnam in an attempt to reconquer the areas which were formerly part of the Khmer Empire. In 1975-1977, the Khmer Rouge regime controlled An Giang and Kien Giang provinces. In 1979, this military adventure was a total disaster and precipitated the invasion of Cambodia by the Vietnamese army and subsequent downfall of the Khmer Rouge, with Vietnam occupying Cambodia. Hoang Sa, Truong Sa islands were lost to China in 1974. Now, Vietnam government requests China to return. 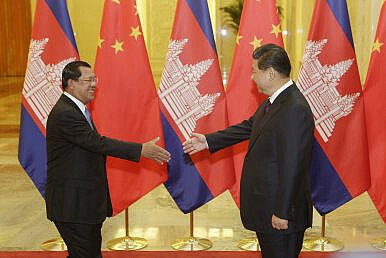 Cambodia wants to request Vietnam government to return the land of Khmer and Koh Tral (Phu Quoc Island)? I have abandoned Khmerization for a long time, not out of my choice but out of circumstances. I have been unwell for sometimes and I'm pretty pre-occupied with my works and family. For all these reasons, I'm very sorry that I have left it to some people to carry on the works of Khmerization for me. I wish to appeal to those who have the time and the dedication to carry on the works of Khmerization to step forward and continue the works. I wish to thanks all those who dedicated their time and hard works to serve the Khmerization readers, particularly School of Vice, Manekseka Sangkum, Khmer Wathanakam and others. You have done such a fantastic job. For that, I thank you from the bottom of my heart. I wish to inform readers that I am unable to return to manage Khmerization full time. However, I'll try to pop in from time to time. Thank you to all the dedicated Admins and readers. Hun Sen buy "like" on Facebook. 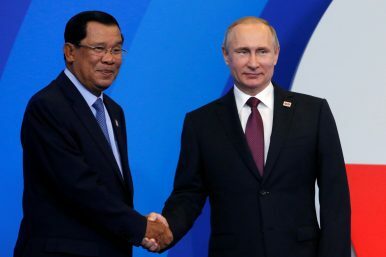 Russian President Vladimir Putin shakes hands with Cambodia's Prime Minister Hun Sen during a welcoming ceremony for heads of the delegations at the Russia-ASEAN summit in Sochi, Russia, May 20, 2016. Even if the economic rewards aren’t astronomical, the partnership is beneficial for both sides. Why is Cambodia buying crocheted fabric from Belarus and leather saddles from Kyrgyzstan? In its efforts to bolster trade and forge new international alliances, the Southeast Asian Kingdom has opted to increase ties with some unlikely partners: the members of the Eurasian Economic Union (EEU). Launched by Russia in 2015 as a counterweight to the European Union, the EEU came into force with the accession of Belarus and Kazakhstan. Shortly thereafter, Armenia and Kyrgyzstan joined its ranks. But while the EEU’s raison d’être was ostensibly economic, its financial benefits are considered largely inconsequential. The union represents a market of a little over 180 million people and a GDP of around $2.2 trillion, but most members have low levels of industrialization, and there continue to be disagreements over tariffs and protectionism even within the union.